You will find our 12 significant Civil War figures below with biographical information included. You may use these resources to prepare your Civil War documentary slides for Theme 1b. Remember that you must have Abraham Lincoln, Jefferson Davis, 1 Confederate officer, and 1 Union officer at the very least! 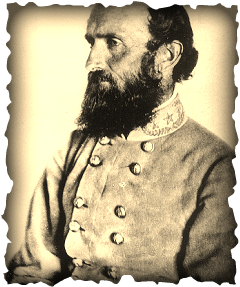 Thomas “Stonewall” Jackson (January 21, 1824 – May 10, 1863) was a Confederate general during the American Civil War. General Jackson fought in the Mexican-American war as a second lieutenant and led troops as a commander during over 20 battles of the Civil War. His most noteworthy battles were the First and Second Battles of Bull Run, the Battle of Antietam, and the Battles of Fredericksburg and Chancellorsville where he was wounded and died a week later as a result of pneumonia. Military historians consider Jackson to be one of the most gifted tactical commanders in United States history. He is highly regarded as one of the most innovative and bold commanders throughout the world and was known for his tough as nails attitude and discipline. He earned his nickname “Stonewall” at the First Battle of Bull Run because of his determination to stop Union forces at any cost. Jackson was born in Clarksburg, Virginia (presently in West Virginia) and died in Guinea Station, Virginia on May 10, 1863. He served in the United States Army from 1846-51 and in the Confederacy’s Army from 1861 to his death in 1863. Jackson was extremely secretive about his military plans and very determined and focused in regard to military discipline. Because of this, he often left his subordinates out of key decisions and lost favor with some of his men. His intelligence and good timing, however, were the keys to his many triumphs on the battlefield. He is best known for his victories and triumphs at the First and Second Battles of Bull Run, Antietam, and Fredericksburg. 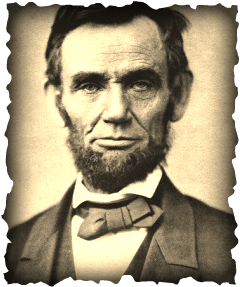 Abraham Lincoln (February 12, 1809 – April 15, 1865) was the 16th President of the United States (POTUS), serving from March 1861 until his assassination in April 1865. He successfully led the country through its greatest internal crisis – the American Civil War. He preserved the Union, ended slavery, and promoted economic modernization. He was born in Hardin County, Kentucky to a poor family and, through self-education, became a lawyer, an Illinois state legislator, US Representative, and then President. He was a member of the Whig party from 1832-1854 and a member of the Republican Party from 1854 to his death. Lincoln is best known for his Emancipation Proclamation in 1863 - which declared that all slaves in the United States would be freed as the Union Army advanced through the Confederacy – and his Gettysburg Address which he gave on November 19, 1863 in commemoration of the soldiers who lost their lives at the Battle of Gettysburg. 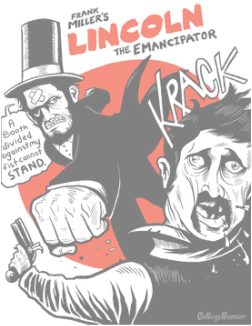 Lincoln was reelected in 1864 to serve a second four-year term as POTUS but his term and life were cut short when John Wilkes Booth, a well-known actor and a Confederate spy, mortally wounded President Lincoln by shooting him at point-blank range in the back of the head while Lincoln and his wife were attending a play. Lincoln died nine hours after the attack at Peterson House across the street from Ford’s Theater. Lincoln will always be remembered as a champion of civil rights and as a defender of the United States of America. 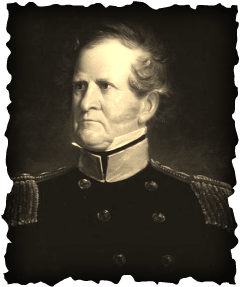 Winfield Scott (June 13, 1786 – May 29, 1866) was a general in the United States Army. He was nicknamed “Old Fuss and Feathers” for his insistence on military appearance and discipline at all times while serving active duty. He holds the record for serving active duty as a general in the United States Army (20 years) and many historians rate him the best American commander of his time. He served a total of 47 years (1808-1861) and commanded forces in a great number of battles including the War of 1812, the Mexican-American War, the Second Seminole War, and the American Civil War. Scott was born in Dinwiddie County, Virginia and died in West Point, New York. He proudly served the United States of America before and, briefly, during the American Civil War. He served as Union general-in-chief at the beginning of the Civil War but was far to old to take part in battle himself. Scott is credited with developing the Union strategy known as the Anaconda Plan that would be used to defeat the Confederacy. This plan was based on the idea that by occupying key terrain and waterways, the Union could cut off the Confederacy from the rest of the world and slowly choke them out. It proved to be a good idea. 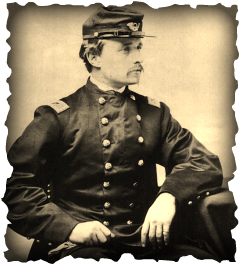 Robert Gould Shaw (October 10, 1837 – July 18, 1863) was the colonel (ker-nuhl) in command of the Union’s all black 54th Regiment. Shaw was born into a prominent abolitionist family in Boston, Massachusetts and died at Morris Island, South Carolina after a failed attempt to capture Fort Wagner from the Confederacy. Shaw took part in the battles of Winchester, Cedar Mountain, and Antietam while serving with the 2nd Massachusetts Infantry and served from 1861 to his death in 1863. Shaw initially declined the offer to lead the new all-black regiment of soldiers, but after reconsidering he took up the post and learned to deeply respect his men. Leading his men at assault of Fort Wagner in Charleston, Colonel Shaw was shot through the heart as he bravely led his unit forward through fierce Confederate fire. The Confederates ended up burying him in a mass grave with many of his soldiers. They intended this to be an insult to both Shaw and the Union as he commanded black troops. Shaw will always be remembered as a crusader for social justice and a defender of the Union. 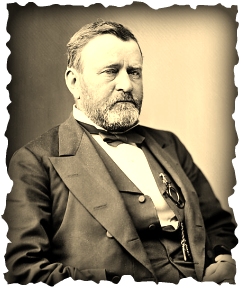 Ulysses S. Grant (April 27, 1822 – July 23, 1885) was the 18th President of the United States (1869-1877) as well as military commander during the Civil War and post-war Reconstruction period. Under his command, the Union Army defeated the Confederate military and ended the Confederate States of America. Just like Robert E. Lee, Grant graduated from the United States Military Academy at West Point. Grant was born in Point Pleasant, Ohio and died in Mount McGregor, New York at the age of 63. He fought in the Mexican-American War and the Civil War before becoming Commanding General of the United States Army. He retired as a four-star general. Grant commanded troops at the Battle of Shiloh, which, because it was such a costly battle, solidified his role as a great leader. He also commanded troops at the siege of Vicksburg, the battle of Chattanooga, and the Siege of Petersburg. Grant ended up serving approximately 22 years of service from 1839-1854 and from 1861-1869. 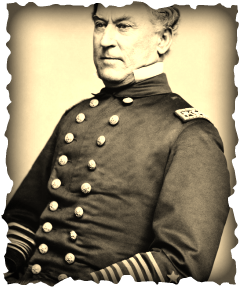 David Glasgow Farragut (July 5, 1801 – August 14, 1870) was an admiral of the United States Navy during the American Civil War. He is remembered in popular culture for his order at the Battle of Mobile Bay, usually paraphrased: “Damn the torpedoes, full speed ahead!” by U.S. Navy tradition. He served in the U.S. Navy from the age of 9 (1810) to his death in 1870. Farragut was born in Campbell’s Station, Tennessee – a slave state – and, in fact, lived in Norfolk, Virginia prior to the Civil War’s outbreak, but fought for the United States of America during its war with the Confederate States of America. Farragut made it clear to all who knew him that he regarded secession as treason. Just before the war broke out, he moved to a small town just outside New York City. Throughout the war, Farragut eventually commanded a naval fleet at the Battle of Forts Jackson and St. Philip, the Battle of New Orleans, the Siege of Vicksburg, the Siege of Port Hudson, and the Battle of Mobile Bay. He saw victories at New Orleans, Vicksburg, and the Battle of Mobile Bay where he bravely charged his fleet through a heavily mined bay and eventually took the area from Confederate Admiral Franklin Buchanan. 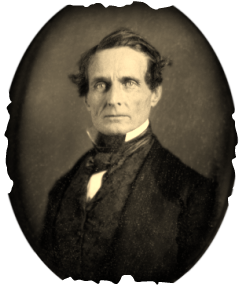 Jefferson Finis Davis (June 3, 1808 – December 6, 1889) was an American statesman and leader of the Confederacy during the American Civil War serving as President for its entire history. He graduated from West Point military academy and later fought in the Mexican-American War as a colonel of a volunteer regiment. He was also the United States Secretary of War under Democratic President Franklin Pierce. He served as a Democratic U.S. Senator for the State of Mississippi. Davis was born in Christian County, Kentucky and died in New Orleans, Louisiana in 1889 at the age of 81. He served in the military from 1828-1835 and again from 1846-1847. He served as President of the Confederate States of America from February 18, 1861-May 5, 1865. He was the first and last president of that country. Interestingly enough, as a senator he fought against secession, but did agree that each state was sovereign unto itself and had an unquestionable right to secede from the Union. In February of 1861, less than two months after the first seven states seceded from the Union, Davis was elected without opposition to a six-year term as President of the Confederate States of America. His diplomatic efforts with other countries tended to fail and he led the Confederacy’s economy into the ground. Many historians have criticized him as a terrible leader. Davis was captured by Union forces on May 10, 1865, charged with treason, and forced out of politics. Eventually, he encouraged Southerners to be loyal to the Union long after the war ended. 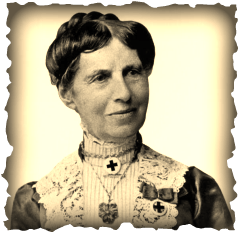 Clarissa “Clara” Barton (December 25, 1821 – April 12, 1912) was a pioneer American teacher, nurse, and humanitarian. She is best remembered for organizing the American Red Cross. She was born in Oxford, Massachusetts in 1821 and developed her interest and love for nursing at a young age. Barton tended to her first wounded soldiers of the American Civil War in April of 1861. She worked with Massachusetts soldiers that were quartered in the U.S. Senate chambers in Washington, D.C. Just a few months later in July, Barton worked established the main agency that would obtain and distribute supplies to wounded soldiers after the First Battle of Bull Run. In August of 1862 she finally obtained permission to travel to the front lines of battles and served during the Siege of Petersburg and Richmond, Virginia. IN 1865, President Abraham Lincoln himself placed Clara in charge of the search for the missing men of the Union Army. After the war ended, Barton was involved with the woman’s suffrage movement and became an activist for black civil rights. Under the presidency of Chester Arthur, Barton finally organized the American branch of the Red Cross (now known as the International Committee of the Red Cross), an international organization that still exists today and is committed to the protection of victims of international and internal armed conflicts. She will always be remembered as an American hero and a strong female leader and champion of the sick and wounded. 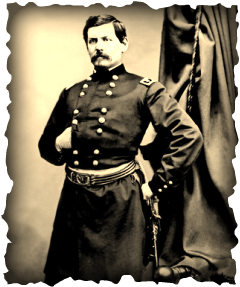 George Brinton McClellan (December 3, 1826 – October 29, 1885) was a major general during the American Civil War. He is responsible for organized the famous Army of the Potomac and served as general-in-chief of the Union Army for a brief time. He was born in Philadelphia, Pennsylvania and died at the age of 58 in Orange, New Jersey. He served as an officer in the U.S. Army from 1846-1857 and from 1861-1864. McClellan was known for being meticulous (that is, he showed great attention to detail) in his planning and preparations. This proved to be very helpful in many instances, but in others McClellan’s need to be “too careful” caused him to react too slowly and, at times, not react at all – leaving his units unengaged and virtually worthless at decisive points of battle. McClellan led fought in the Mexican-American War and the following battles of the American Civil War: Battle of Rich Mountain, the Peninsula Campaign, Seven Days Battles, and the famous Battle of Antietam where he was able to force Confederate general Robert E. Lee’s troops to cease their invasion of Maryland. McClellan, however, failed to maintain President Lincoln’s trust and was occasionally insubordinate to his commander-in-chief. Funny enough, after he was relieved of his command, McClellan became the unsuccessful Democratic nominee opposing Lincoln in the 1864 presidential election but, of course, lost (his plan was to end the war and negotiate with the Confederacy!). He ended up serving as the 24th Governor of New Jersey from 1878-81. 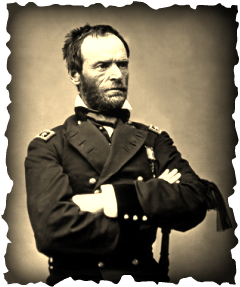 William Tecumseh Sherman (February 8, 1820 – February 14, 1891) was an American soldier and educator. He served as a General in the Union Army during the American Civil War and is known for being an outstanding commander and military strategist but also for his incredibly ruthless (and evil?) destruction of the South during his “scorched-earth” March to the Sea. Sherman was born in Lancaster, Ohio and died in NYC, New York at the age of 71. He served in the United States Army from 1840-53 and then again from 1861-84. He was promoted to Major General during the Civil War and then served as General of the Army of the United States after the War and Ulysses S. Grant’s retirement. He fought in the First Battle of Bull Run, the Battle of Shiloh, and many other campaigns. 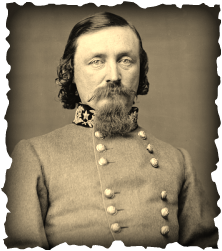 George Edward Pickett (January 1825 – July 30, 1875) was a career United States Army officer who became a general in the Confederate States Army during the American Civil War. He is best known for his participation in the futile (pointless) and bloody assault at the Battle of Gettysburg that bears his name, Pickett’s Charge. He was born in Richmond, Virginia and died at the age of 50 in Norfolk, Virginia. He served in the United States Army from 1846-61 an in the Confederacy’s army from 1861-65. He fought in the Mexican-American War and then in the Civil War as a commander at the Battles of Fredericksburg, Gettysburg, Petersburg (the Second), and the Battle of Five Forks towards the end of the war. Similarly to many other notable military commanders, Pickett attended West Point where he was a class clown and ending up graduating 59th of 59 students – a position known as “the goat.” Pickett ended up serving well and, when the attack on Fort Sumter happened, he marched to Virginia to serve his state. Even though Pickett did not support slavery, he believed strongly in the South’s right to secede and bravely defended the Confederacy. Pickett is best known for his command of troops at the Battle of Gettysburg. Pickett’s troops arrived at the end of the second day of the three-day battle, and were quickly instructed by General Lee to support a charge into the Union forces with two other divisions. After barraging the Union forces with artillery shells for two hours, Pickett (along with the two other commanders) charged head on towards the Union forces, killing and wounding 1,500 Union soldiers. Pickett’s men weren’t so lucky. 50% of the men sent across the fields were killed or wounded. Pickett’s 15 commanders were casualties. It is known as one of the deadliest (and dumbest?) tactical decisions of the war. It helped solidify the Confederacy’s loss of the battle, which, eventually, proved to lose the war to the Union. Lee, nicknamed the “Marble Man,” was born in Stratford Hall, Virginia and died in Lexington, Virginia. He served from 1829-61 for the United States and from 1861-65 for the Confederacy. During the Civil War, Lee commanded troops in a number of battles, specifically the Second Battle of Bull Run and the Battle of Gettysburg. 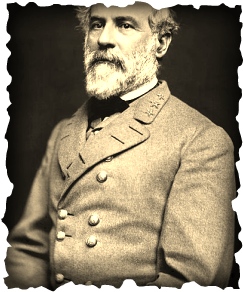 Lee is probably best known for his role as general-in-chief of the Confederate forces and his surrender to General Ulysses S. Grant at Appomattox Court House, Virginia on April 9, 1865, which essentially ended the Civil War.